Alphabet Inc unveils Atlas, a humanoid robot that can walk in the snow and lift boxes, then promptly attacks it with a hockey stick. The robot revolution is coming. Academics predict as many as half our jobs will be lost as automation spreads throughout the workplace, and our labour-saving tools become so effective as to do away with the need for labour altogether. It’s tempting to imagine that this will involve hoards of scary metallic androids, but the future’s coming out of Silicon Valley, not Hollywood. Most likely, the ‘robot’ that will make you redundant will be an algorithm, not a Terminator. Still, that hasn’t stopped companies from trying to perfect the all-purpose humanoid robot. 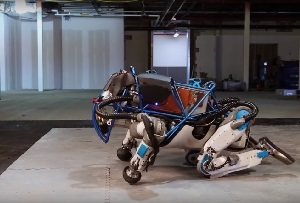 Boston Dynamics, a subsidiary of Google’s wacky other half/parent Alphabet, has been working on the latest version of Atlas, a 180lb, 5’9 machine that likes stacking shelves and walks in the woods on snowy days. Atlas has some impressive, Bruce-Lee-esque getting-off-the-floor skills, and knows how to lift with its legs. Presumably, Alphabet’s technicians were harassing Atlas with sticks to prove its mettle (sorry) in the face of hostile working conditions. Imagine that – a tireless employee that can work with even the most obnoxious colleagues without even a thought of filing a complaint to HR. It’s a manager’s dream. Well, it would be if it didn’t do away with the need for management altogether (you don’t need an MBA to press the ‘on’ switch on a robot, after all). Judging by Atlas’s unsteadiness (and presumably cost), there’s still clearly a long way to go before machines would be viable alternatives to manual labour, but the chances are that eventually they will get there. Who’ll be able to afford to employ them when no one’s got a job is another matter. Perhaps all those mechanical shelf-stackers, pub landlords and hairdressers will eventually find themselves terminated for lack of demand. Mass robot unemployment? Stranger things have happened (probably).